As displayed in the above diagram, there are three states of a servlet: new, ready and end. The servlet is in new state if servlet instance is created. 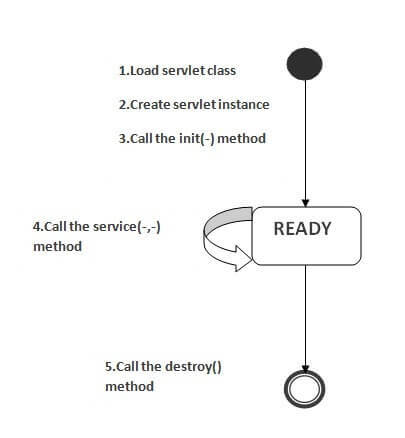 After invoking the init() method, Servlet comes in the ready state. In the ready state, servlet performs all the tasks. When the web container invokes the destroy() method, it shifts to the end state. The classloader is responsible to load the servlet class. The servlet class is loaded when the first request for the servlet is received by the web container. The web container creates the instance of a servlet after loading the servlet class. The servlet instance is created only once in the servlet life cycle.